Contemporary yet traditional, this wooden house resembles a pretty mountain chalet with its warm walls and large sloping roof. Amply insulated, the residence features a wooden pellet stove as well as a solar water heater. 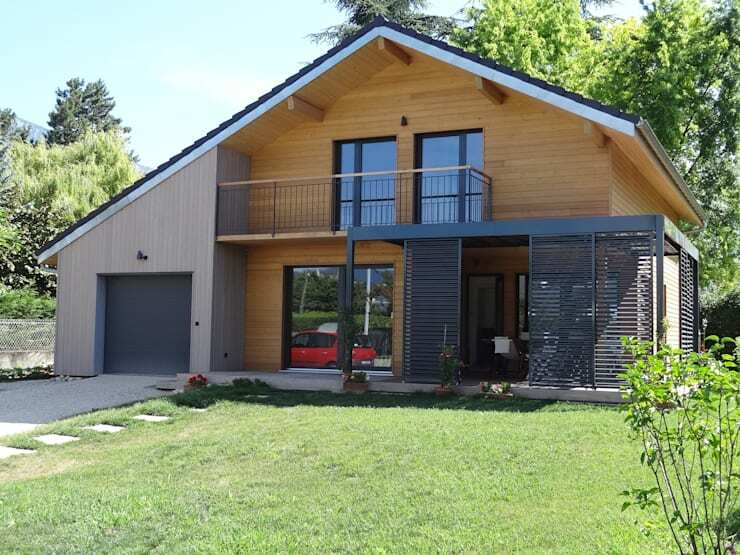 Energy consumption is very low and the interiors are generously ventilated. 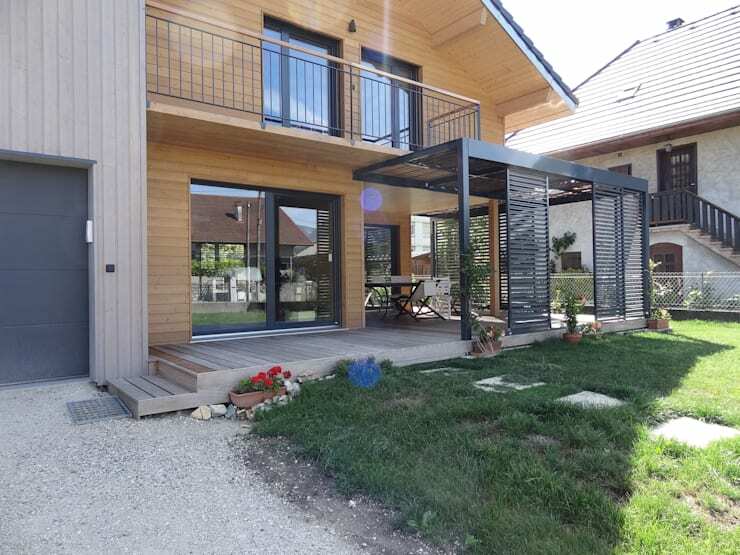 The shaded terrace that accompanies the main building is a special attraction, as it allows the inhabitants to relax, rejuvenate while they watch the kids play around the garden. Credit for this creation goes to the architects at Tangentes Architectes. The asymmetrical roof lends a unique character to this quaint wooden house, while the upper floor balcony and shaded terrace offer spots for outdoor pleasures. Large glass windows lend a modern touch to the facade, while the garage comes in a lighter shade of wood so as to create its own identity. The lawn in front is well-maintained, and tall trees make for a refreshing backdrop. Rendered in black metal, the pergola above the terrace creates sharp contrast against the warm wooden walls. 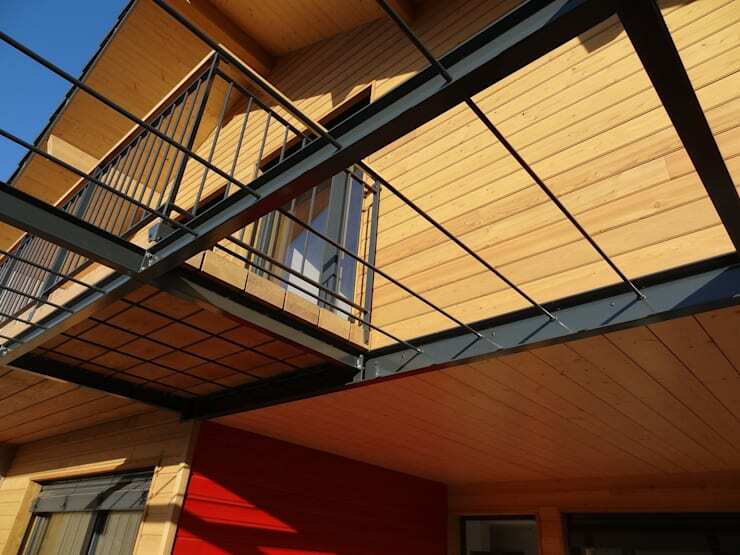 The balcony railing serves the same purpose and adds personality to the building. Spacious and shaded, the terrace looks perfect for enjoying summer days while breathing in fresh air. Trendy and simple furniture adds to the comfort here, so that you can relish afternoon teas or candle-lit dinners even when it’s very hot or raining. Note how large pavers have been laid across the grass to lead you to the large sliding glass door entrance. 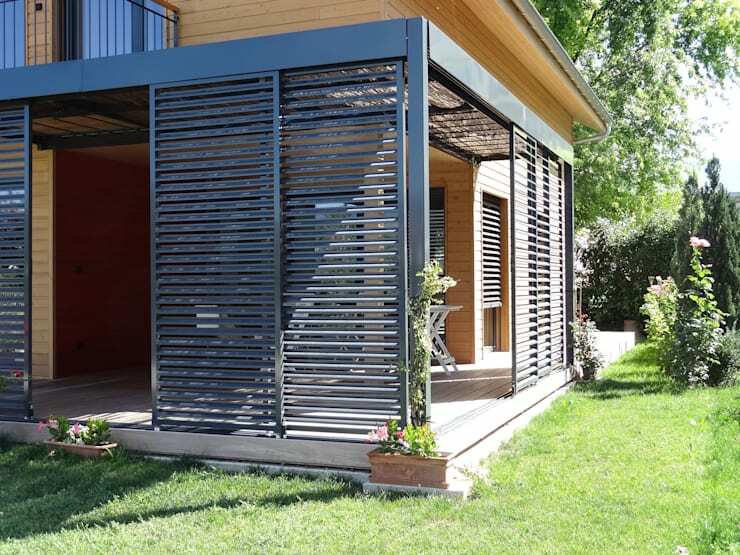 Sliding metal doors protect the terrace on two sides to keep you safe and cosy even when the weather is unfavourable. This way, you can enjoy outdoor meals or chat with loved ones when it’s unbearably hot or raining. The Louvre-like design of the doors allows natural light and fresh air to enter the terrace even when the doors are closed. 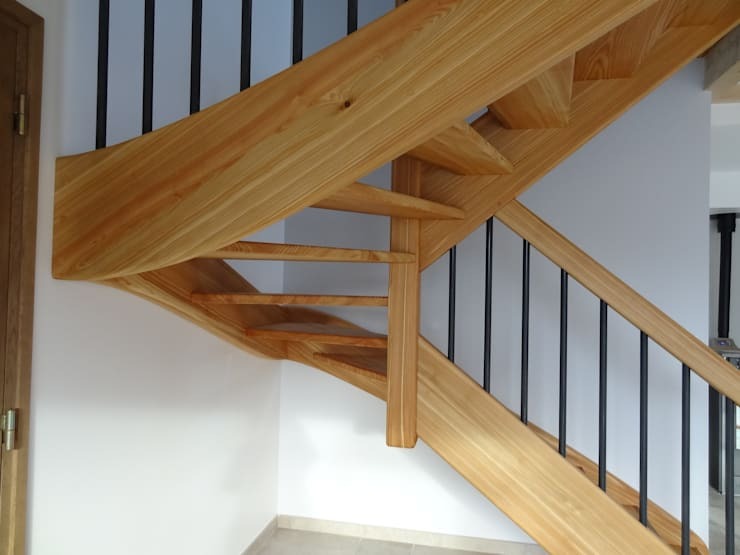 Light-hued wood pairs up with neat black metal railing to make this staircase a modern yet warm and homely affair. The structure stands out elegantly against the white walls and feature floating steps for an airy appearance.